HOW far will your P3 go? For a kid, this loose change would be enough to satisfy his sweet tooth. For an adult on a tight budget, having street food sold at P3 for dinner might not be as bad as it sounds. But for a candidate with a political party, P3 is what they are only allowed to spend for every voter registered within their constituency. Taking into account economic factors such as inflation, Provincial Election Officer Ferdinand Gujilde said the campaign spending cap is "unrealistic" in today's setting. "It is not realistic because that law was passed way back in 1991 and had not been adjusted by Congress since then despite inflation. Candidates, though, have no choice but to abide by it because that is what the law says. The law should be revisited, but whether candidates follow is another issue altogether," he said. So, how much does it cost to win an election? Enacted in 1991, Republic Act (RA) 7166, provides for synchronized national and local elections and for electoral reforms. Section 13 specifies amounts that a candidate or registered political party may spend for election campaign. An aspiring president and vice president shall only spend P10 per registered voter. Other candidates spend P3 per voter. Independent candidates or candidates without the support of political parties, though, may spend up to P5 per voter. Political parties and party-list groups may spend P5 per voter. Comelec will assess the amount commensurate with the election expenses and add it to the the total expenses incurred by the candidate. To get the total amount of spending allowed for the election campaign, the number of registered voters within the constituency is multiplied by the authorized expense per voter registered in the constituency. For example, if Cebu Province has 3,082,621 registered voters, candidates with political parties are only allowed to spend around P9.24 million, while an independent candidate can spend P15.41 million for their campaign. If Cebu City has 711,514 registered voters, candidates belonging to a political part are only allowed to spend P2.13 million for their campaign, while independent aspirants can spend P3.55 million. 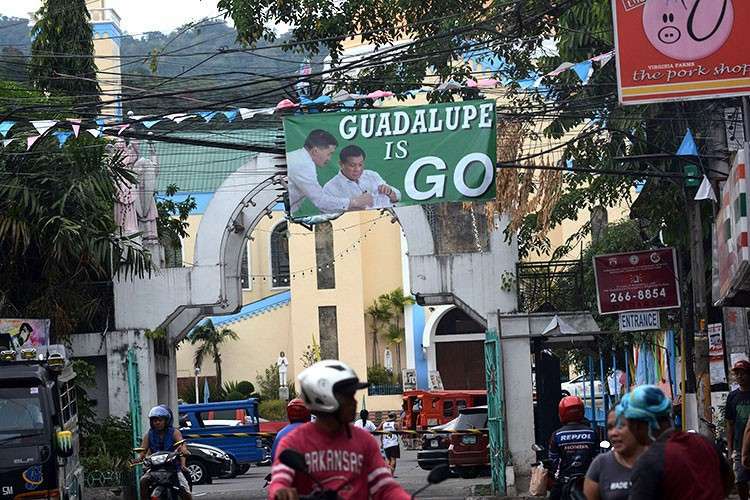 Grace Magalzo-Bualat, a faculty member of the University of San Carlos Department of Political Science, School of Law and Governance, agreed with Gujilde. "This is another example of Congress sleeping on the job. Legislative Power encompasses not just the power to create but also the power to alter (amend/revised) and the power to repeal laws, when the need arises or when the circumstances from which it was based is no longer applicable. Had Congress amended Section 13 of RA 7166 on Authorized Expenses of Candidates and Political Parties, these traditional politicians cannot just easily find their way around the law in the guise of 'Donated by Friends of'," she said. "But while RA 7166 has not yet been amended, despite the fact that it failed to address current contingencies, candidates are expected and mandated to abide by this law. In the same manner, Comelec is expected and mandated to strictly implement this law," Magalzo-Bualat said. Cebu third district congressional candidate Pablo John Garcia gave his thoughts on the spending cap. "The limits were established during martial law when a bottle of soda was maybe less than P1. Now it’s P12. So, of course, the limits provided by law are outdated and even Comelec knows it. A reasonable reading of the law should make room for inflation and the present value of money," he said. "It's not for Comelec to say because it's the law. But I think the Comelec should focus instead on peace and order, prevention of fraud and ensuring the voters get to vote instead of focusing on enforcing these outdated, antiquated limits." For Mabolo Barangay Captain and Cebu City Council aspirant Prisca Niña Mabatid, legislators should consider amending the law to go with the times. She said if the spending cap can be increased, the better. "Makita man sa high-profile politicians, dagko man gyud og gasto (It's quite apparent with high-profile politicians that they spend a lot). Basta ako, stick lang ko sa balaod (But I stick to the law)," she said. Cebu City vice mayoral candidate Michael Rama suggested creating a body, "a truth commission," that will determine a better spending cap for electoral candidates. The antiquated spending cap "is just the tip of the iceberg," Magalzo-Bualat said. "It's about time that our election laws must undergo a comprehensive review by Congress in order to point out the problematic areas and identify ways to improve. Electoral Reform should be a priority legislation. This includes passing the anti- political dynasty bill, creating a bill that would regulate anti-turncoatism, and assess our party and electoral systems," she said. "Moral Lesson: Voters must be very critical in electing candidates for senators, district representatives, and party lists. Most of our problems spring from the fact that we keep on voting the wrong individuals," she added. But unlike in previous elections, candidates can now also campaign through social media, giving them a newer and cheaper avenue to promote themselves politically. Traditional campaign materials, such as tarpaulins, usually cost P12 per square feet in the shops along Sanciangko St. According to rules set by the Comelec, tarpaulins cannot be larger than two by three feet (that costs P72) or three by eight feet (P288). Candidates also use other sizes, such as 18 by 24 inches, which costs P36 per piece, and 12 by 18 inches, which goes for P18. The shops along Sanciangko St. also offer to do the layout, for P100 per design. For candidates who want leaflets, aside from tarpaulins, most shops also offer to print 500 copies for P230 (using risograph printing) if Substance 20 paper is used, and P190 for Substance 16 or thinner sheets. But with social media, candidates not only gain a higher reach, but can also post for free or boost their posts by paying P200. Provided, though, that the website or social media page is registered with the Comelec education and information department. Once it is registered, the candidate can now use it as a campaign tool. Promulgated on Jan. 30, 2019, Comelec Resolution 10488 lays out the rules and regulations implementing RA 9006, or the Fair Elections Act, in connection with the May 13 national and local elections. Section 6 of the resolution says that lawful election propaganda will now include "social media posts, whether original or re-posted from some source, which may either be incidental to the poster’s advocacies of social issues or which may have, for its primary purpose, the endorsement of a candidate only." The resolution also defines social media as a "form of mass media." It refers to the collective online communication channels, including websites and applications that enable users to create or share content, collaborate and interact with each other. To ensure a level playing field and avoid conflict of interest between future public officials and some stakeholders, the Comelec has provided a list of prohibited political contributions from certain personalities. Section 95 of the Omnibus Election Code states that no contribution for purposes of partisan political activity shall be made directly or indirectly by public or private financial institutions, and natural and juridical persons operating a public utility or in possession of or exploiting any natural resources of the nation. Candidates are also prohibited from accepting contributions given by educational institutions that receive grants of public funds amounting to no less than P100,000; officials or employees in the Civil Service Commission; members of the Armed forces of the Philippines; and foreigners or foreign corporations. To keep candidates and political parties from spending lavishly, every candidate and treasurer of the party are mandated to file the full, true and itemized statement of all contributions and expenditures 30 days after the day of elections on May 13. No person elected to any public office shall enter upon the duties of his office until he has filed the statement of contributions and expenditures herein required.